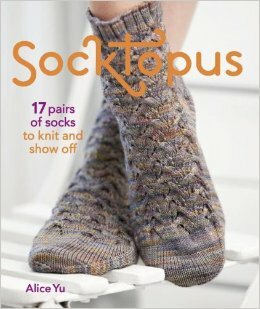 Socktopus by Alice Yu is a delightful sock book with 17 original patterns. From the introduction to the first chapter on sock yarn and onto the patterns, Ms. Yu’s witty word entertain and inform; a surprising feat for a non-fiction reference book. Very often, designers tend to fall back on set structures, especially when creating socks. When I knit a sock from this book, I am reminded that there is always another way to do anything. But is this the best pattern book for you? Maybe. The first chapter is a crash course on sock yarn basics. (This is a fascinating subject to study, and if you are interested in learning more about it, check out any of Clara Parkes’s books. Here is the link for my book review of The Knitter’s Book of Socks.) There are some parts that are invaluable, and I have not seen in other sock book, such as the section on the different names for sock yarns in different parts of the world. The next chapter (no. 2) is this book’s crown jewels: the sock patterns. It begins with a plug-in-your-numbers plain vanilla sock that can be used with any gauge, and, if you’re just starting to design, is very helpful in seeing how your pattern will turn out. The following 16 socks are based off of Ms. Yu’s experiences, nature, family, and various fandoms (including Eragon and Supernatural, among others). I’m not entirely sure which sock I like best… probably Rumpled! or De Stijl. The final sock in this collection is Spring Shoots. This sock is made in a way invented by the great designer Cat Bordhi: the afterthought leg. I’ve never tried this before, but it looks complex and interesting. I will be sure to give it a try one of these days. This is not a post about afterthought legs, but since I mentioned it, I better clarify. The foot is begun as in a toe up sock. After the toe is worked, the foot is worked to about two inches from desired length of the total foot length, and another toe is worked, but this one like a cuff down sock; the stitches are decreased instead of increased. Then, when the remaining toe stitches are grafted together, you have a tube without any openings; no way in or out. You then pick up stitches on the top of the foot with one knitting needle, about where the leg would have been, and, with a different needle, pick up another strip of stitches two rows across from the previously picked up stitches. Now you do the unthinkable: In between your two needles, there is a single row. You take scissors and cut the row out, leaving a gaping hole in your fabric. Now, you can continue knitting for the leg. This method is risky, yes, but after you cut your knitting, I would think that there is nothing that you can be afraid of doing again. As I said earlier, this book may not be the right book for you. I would only recommend this book to experienced knitters, or someone with an experienced knitter on speed-dial. The reason for this is there are many sizing and gauge issues in this book, and some patterns are very difficult to understand and work. Before knitting most of the socks out of this book, know the rudiments of gauge and how to adjust things for sizing in and out to avoid mistakes even before you reach them. There were also some typos in the book, but you can find an errata here. Although Socktopus has many good facts and patterns, there is also a need for clarifying the patterns and correcting some of the socks’ sizing. I would definitely not recommend this book to a new knitter, and even some advanced knitters could have trouble with the patterns.